WordPress CMS become a popular plate form for starting any type of website. Why it’s so popular because it is much flexible than any other platform, Easy to use, Almost anything can be done with the help of plugins, just a little need of coding knowledge etc. But WordPress default editing panel is not SEO friendly and don’t enable users to add some essential search engine optimization information to posts and pages like SEO meta title, description etc. So we need an SEO plugin (such as Yoast WordPress SEO) for wordpress website to do better search engine optimization. When we talk about WordPress SEO Plugins, Yoast WordPress SEO Plugin is known as the best plugin for search engine optimization of your wordpress powered website. This plugin is recommended by many expert bloggers because it have a lot of features such as keywords density, Allow to add meta titles, description and keywords, XML sitemaps, Internal linking, Webmaster and Social tools Integration etc. these all features make it a powerful seo plugin. Yoast WordPress SEO plugin features are not less than any premium one, but you don’t need to pay a single penny. It’s absolutely free and this is another reason for its popularity in WP users. I highly recommend this plugin for wordpress users to enhance search visibility and ranking. If you don’t want to spend money in premium plugin then it’s worth trying, I can say you will not be disappointed. How to Install and Activate Yoast SEO WordPress Plugin? Before toward to guide How to setup Yoast WordPress SEO, I would like to mention features of this plugin. As you can see this plugin provides all the essential features that important for proper search engine optimization. Anyway, now let’s talk about the proper setting and configuration of Yoast WordPress SEO. General: Here at the dashboard Start Tour button helps you to learn quickly about the plugin usages. If you messed up/wrong configure plugin settings then simply click on Reset button, all the plugin setting will be reset to default as plugin author configured. Tracking: You can tick on Tracking box if you like to share plugin statics anonymously with the developers. Developers use this tracked data to maintain plugin quality and also it helps to find bugs in the plugin. On the other hand, you can leave it unchecked. Security: If your authors and editors are trustable then uncheck security box. It allows author and editors to redirect and no-index posts/pages. Webmaster Tools Verification: At the end of dashboard, Yoast wordpress seo plugin help you to verify your website with different webmaster tools such as Google, Bing, Yandex, Pinterest and Alexa by inserting tracking code which are provided by them. Titles Force Rewrite: Leave this box as it is. Symbols between post title and site name are the separator. You can select any one which one you like. No-index subpages: If you don’t want to index sub-pages in search engines then tick on no-index subpages of archives check box. Meta keywords tag: Tick on meta keywords check box. Noodp: Do you like to allow search engines they show description about your site picked from DMOZ directory? If yes then leave this box otherwise tick it. Noydir: Leaving noydir check box allow search engines to pick yahoo directory description for pages from your site in the search results. Head cleanup: Tick on all boxes it helps to clean up the head section of your website. %%sep%% Separator between site name and site description. Enter your meta description and main or your blogging niche keywords. As Google announced they don’t give importance to meta keywords in search results, so you can leave meta keywords field, but some other search engines still give importance to meta keywords like Bing, Yahoo. I still recommend you to write meta keywords. Setup the following setting as mention in the above snapshot. Post Meta Description: If you insert %%excerpt%% tag then the yoast plugin will automatically pick meta description from the posts/pages individually. I manually insert meta description for every individual post and also recommend you to enter every post meta description manually. With this way, you can write more catchy and attractive description though it is not known as SEO factor and also don’t help to increase search ranking. But by inserting more attractive meta description you can increase CTR (Click Through Rate) towards your website. If you want to write the description for every post individually then leave blank this field. Post Meta Keywords: Leave this field blank, always use most posts related keywords as meta keywords. Leave all the settings default as these are but don’t forget to tick on no-index, follow and disable the author archives box’s. Yoast seo plugin support three giant social media networks integration option facebook, twitter and google+. Enter your facebook profile/page url address and verify admin role. Twitter: Enter your site twitter username. Google+: Simply paste your website google plus page or profile url address. 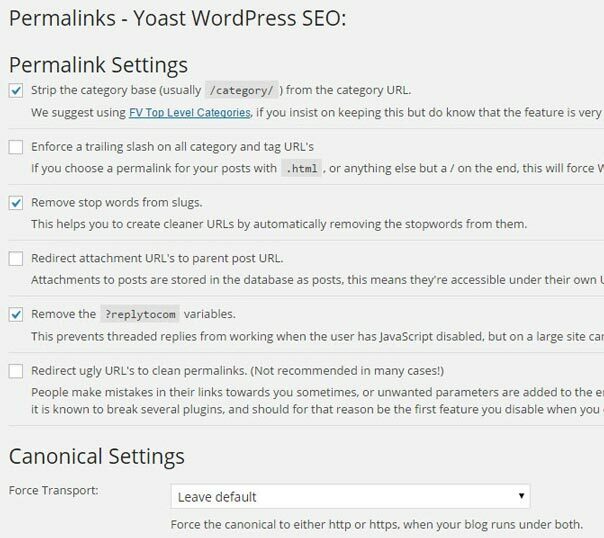 Yoast WordPress SEO plugin also offers sitemap generating feature, So you don’t need to install an additional sitemap generator plugin. But if you want to use different sitemap plugin then XML Sitemaps is another best tool. There is nothing special setting in permalinks just follow below guide. Breadcrumbs navigate users to easily understand that currently where is they are. If your site don’t have breadcrumbs functionality then you can use Yoast breadcrumb setting. This step is little tricky and technical because you need to make some editing into your theme files to enable this function. You can insert any text, message or html code above and below the RSS feeds which are deliver to your site subscribers. One of the best thing of Yoast WordPress SEO plugin is you can import and export configured settings. As you can see yoast plugin is little complicated for beginners so when you properly configured this plugin import settings. You can use imported settings when ever you need. 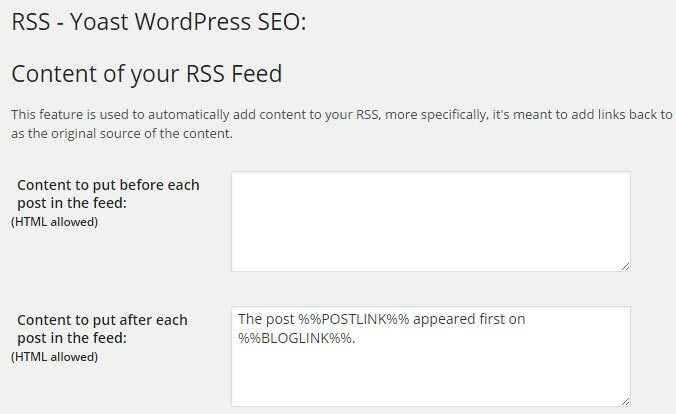 Bulk editor in wordpress seo by yoast plugin help you to view and edit your all posts quickly. Here you can analyse posts meta title, description, page URL and publishing dates. Yoast offer couples of other plugins and services, here you can install and buy more plugins or services offered by yoast. So, the complete guide on How to Install and Setup Yoast WordPress SEO plugin is ended here. I hope you would like this complete guide and it help you to configure all setting properly. Yoast plugin is one of the best SEO plugin for wordpress powered websites. Currently, this plugin s also powering this website to enhance SEO and search ranking. Yoast really done a great work I highly appreciate his hard work. At the end of this tutorial I would like to ask one question, please reply if you don’t mind. Is it make any sense to buy premium seo plugin, though Yoast offering a best SEO plugin freely?